If you need to replace the heat pump in your home, or install a new heat pump during new construction, Global Heating & Cooling is here to help. Our team of leading industry professionals knows everything there is to know about heat pumps, and can assist you as you decide on a system that will work for your specific needs. Heat pumps are a popular alternative to standard air conditioning and heating units. While the initial investment may be higher, they provide unparalleled energy saving benefits. Global Heating & Cooling offers a wide selection of heat pumps for clients to select from. Factors such as the age, size, and layout of the home are all taken into consideration when selecting a heat pump. So, how does a heat pump work exactly? A heat pump utilizes electricity to move heat to either cool or warm a living space. During the winter months, heat pumps move heat into your home, and during the summer months, heat pumps move heat out of your home. Because they are simply moving heat rather than generating the heat, heat pumps cost much less to operate than traditional heating and cooling choices. There are three main types of heat pumps to select from: water source, air-to-air, and geothermal. Depending on the type selected heat will be collected from the water, air, or ground. Air-to-air heat pumps are the most common style of heat pump. Heat pumps which utilize existing ductwork, as well as ductless versions, are available. There are several choices surrounding heat pump selection. Let Global Heating & Cooling help you decide which system would be best for you and your home. We have extensive experience, and countless satisfied customers, which makes us the go-to heating & cooling experts in the area. 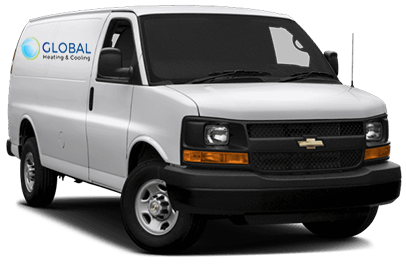 Call Global Heating & Cooling at (773) 801-3734 to receive a FREE ESTIMATE and discuss your options with one of our professionals.